The IT industry has a habit of remaking itself approximately every 10 years, which means MSPs are ripe for dramatic change. New pressures such as technical labor shortages, margin pressures and confusion about technologies like 5G, AI and IoT have MSPs re-thinking their business models. If not, they should be. At the macro level, signs are still very good for MSPs, but underneath this macro view, there is sense of instability. The MSP business model – specifically, the "pay on consumption" business proposition enabled the adoption of Cloud, allowing organizations to evaluate the cost benefits of virtualization, off-premises data centers, Cloud-hosted infrastructure, and Cloud-based functional applications. The flexibility of this model, however, necessitates continuous innovation. What is next? CompTIA 2018 IT Industry Outlook reports that end users are looking beyond the tactical functionality of IT to drive business goals such as customer satisfaction, operational efficiency or offering innovation. Digital Transformation is the next wave of opportunity for MSPs. It's time to change gears and take the Business Opportunity fork in the road. While some MSPs are staying in their data center comfort zone, moving to specialization in technology, such as, Security or Disaster Recovery, others are becoming more customer-oriented, learning the customer's business and relying on specialized partners to augment their integration services. Whichever the case, while some MSP revenue growth in 2019 will come to new client acquisition, more opportunity for MSPs is surfacing from selling more to existing clients. In this scenario, two forces are acting to create a larger impact potential for MSPs. The "aaS" delivery model, as established for IT Infrastructure is now the preferred model for all business services. 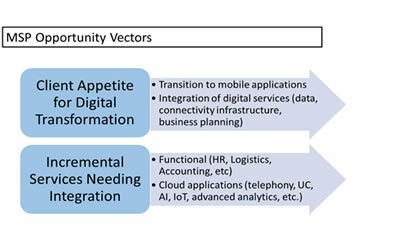 AV, IoT, HR, Logistics, Analytics and Verticalized LOB applications will all need to conform to the "aaS" model. 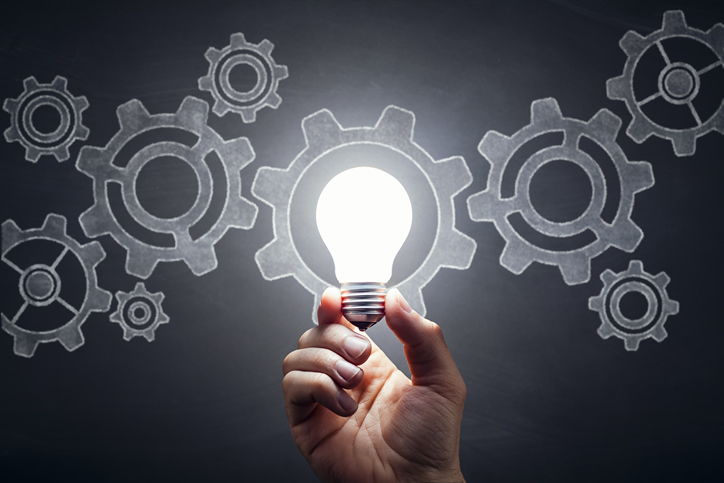 Professional Services Automation (PSA) providers, like ConnectWise and AutoTask, are already preparing the way to accommodate these aligned services. These changes position the MSP to be the business services aggregator and integrator for their clients. The key word here is "position." Client business knowledge. The MSP Remote Monitoring and Management (RMM)/PSA business model brought consistency and reliability to client-centered IT Services. It also laid the groundwork for incorporation of off-premise and cloud-based applications, such as Office 365. For IT Services to assist in the digital transformation, the MSP, acting as the Virtual CIO, will need far greater knowledge of the client's business, beyond IT. What are today's pain points? Where is top-line growth coming from? What are the risks to mitigate? What competitive actions will impact the business? Where are the new opportunities surfacing? Conversations with client owners will be about these topics, not about downtime trending. Partnering for mutual benefit. According to Tiffany Bova (Growth IQ. Penguin Random House, New York, NY, 2018. Page 218), "Partnerships should be proactive and have well-though-out arrangements between the companies, with clear expectations and measurable results." The difference between partnering today and 10 years ago is the MSP is in the driver's seat. It is more important to understand the need and usage of the technology-based business services than the underlying technology. Consequently, the MSP needs to be the partnering leader, the orchestra conductor, assembling the partner suppliers needed to transform the business. Outsourcing beyond IT Infrastructure Services. An interesting byproduct of the MSP RMM/PSA business model is that MSPs have developed excellent onboarding skills and processes. These skills and processes are generic and can be applied to more than IT Services. They can be applied to any other business functions an end client desires to outsource. Due to the MSP's focus on detail and their intimate knowledge of the end client's operational environment, the MSP will manage the outsourced function onboarding better than the functional service supplier. The MSP can monetize this service as a series of projects, even better. 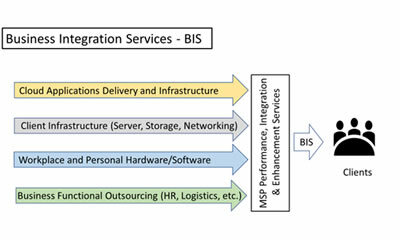 Positioning for Business Integration Services. 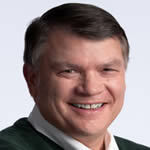 If we agree that the opportunity for MSPs is beyond IT and is centered on delivering digital value to the end user client, it is obvious to see that there is tremendous value in the integration of all sorts of services for the client: cloud line-of-business applications, other aligned technologies from specialized providers and functional outsourced services. According to an IDC study published in September 2016, "By 2020, for every dollar Salesforce makes, the company's ecosystem will gain $4.14. Organizations supplement their Salesforce subscriptions with additional services from consulting partners and additional apps to extend core functionality, built by ISVs on the Salesforce platform." The business client wants data to flow from all these sources for seamless decision-making. Think of a business intelligence dashboard architected by the MSP to meet these and future needs. The role of the MSP is to stabilize the core technology services for its clients, first. After stabilization, the MSP needs to foster innovation for the good of the business client. Stabilize the Core, innovate on the Edge.